Across the globe, one of the most poignant symbols of Islam is the melodious call to prayer. Its sublime sound rings out across cities and meadows, on beaches, in fertile fields and in barren valleys. Once heard, the sound of the adhaan is never forgotten and many people have entered the religion of Islam simply from hearing this soulful sound. Adthaan, which means announcement is mentioned only once in the Quran but never the less, it plays an integral part in the life of a Muslim. For those born into Islam it is often the first sound they hear. Immediately after birth, the father or any other important Muslim in the child’s life holds the newborn and whispers the words of adhaan into his right ear. The time for prayer is announced five times per day, from lofty minarets or from watches and computers. 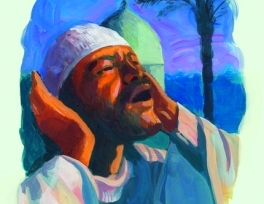 When a Muslim hears the adhaan, preparation for prayer begins. Bilal (may Allah be pleased with him), because of his beautiful voice had the honour of being the first man in the world to call the Adthaan and call the worshippers to prayer. In the year 622 Prophet Muhammad (peace and blessings of Allah be upon him), Bilal (may Allah be pleased with him) and most of the fledgling Muslim community migrated to Medina. It was here that Prophet Muhammad, may God praise him, began the work of setting up the Muslim nation. Bilal (may Allah be pleased with him) was at his side whenever possible and as one commentator said, “Every event in Mohammad’s life was an event in the life of Bilal” . It is said that Bilal (may Allah be pleased with him) was so close to Prophet Muhammad (peace and blessings of Allah be upon him) he (may Allah be pleased with him) had the duty of waking him in the mornings. According to authentic traditions Prophet Muhammad (peace and blessings of Allah be upon him) was concerned and anxious to find a way to summon the Muslims to prayer. He wanted something unique. It was here that Abdullah bin Zaid (may Allah be pleased with him), one of the Companions, informed the Prophet (peace and blessings of Allah be upon him) about a dream that he had. God is Great! God is Great! I testify that there is no true deity but God. I testify that Muhammad is the messenger of God. Come to prayer! Come to prayer! Come to salvation! Come to salvation! God is great! God is great! There is no true deity but God. 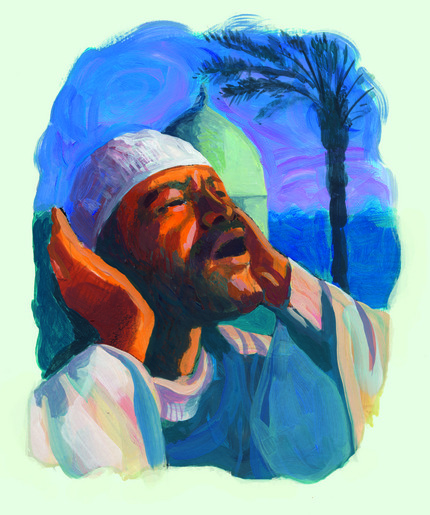 Bilal’s life after his conversion to Islam contained many moments of great joy however his finest hour must have been in 630 BCE, on an occasion regarded as one of the most hallowed moments in Islamic history. After the Muslim forces had conquered Mecca, Bilal (may Allah be pleased with him) ascended to the top of the Kaba, the house of God, to call the believers to prayer. This was the first time the call to prayer was heard within Islam’s holiest city. After the death of Prophet Muhammad (peace and blessings of Allah be upon him), Bilal never felt the same again. A day after the Prophet’s (peace and blessings of Allah be upon him) death, Bilal went to make the usual adhaan for Morning Prayer. While giving the adhaan he (may Allah be pleased with him) broke down and steams of tears began to roll freely down his cheeks. He (may Allah be pleased with him) managed to finish the rest of the adhaan in a low voice. After that, Bilal (may Allah be pleased with him) stopped calling the Adthaan in Madina. The memories of Madina were too hard for him to live with, and he left for another place. Later, upon his visit to Madina at the behest of the Prophet Muhammad’s grandsons he agreed to give the Adthaan. Old memories that lay deep down in his heart were revived and those who had experienced the golden days with Prophet Muhammad (peace and blessings of Allah be upon him) could not hold back their tears. It is believed that Bilal died in Syria between 638 and 642BCE. Imam al-Suyuti in his book ‘Tarikh al-Khulafa’ writes, “He (Bilal) (may Allah be pleased with him) died in Damascus when he was just over sixty years old.” Others are of the opinion that he died in Medina. We can be sure that his eternal abode is Paradise for Prophet Muhammad, may God praise him, called Bilal “a man of paradise” . The one who calls the believers to prayer.